Long heard of Chef Daniel’s Kitchen from Hui Yuan’s blog but I didn’t expect the grandeur of the the restaurant. Situated on the 7th floor Iluma, a rooftop park, it is the only shop. It is an open concept with full panel glass, allowing you to look at the greenery. 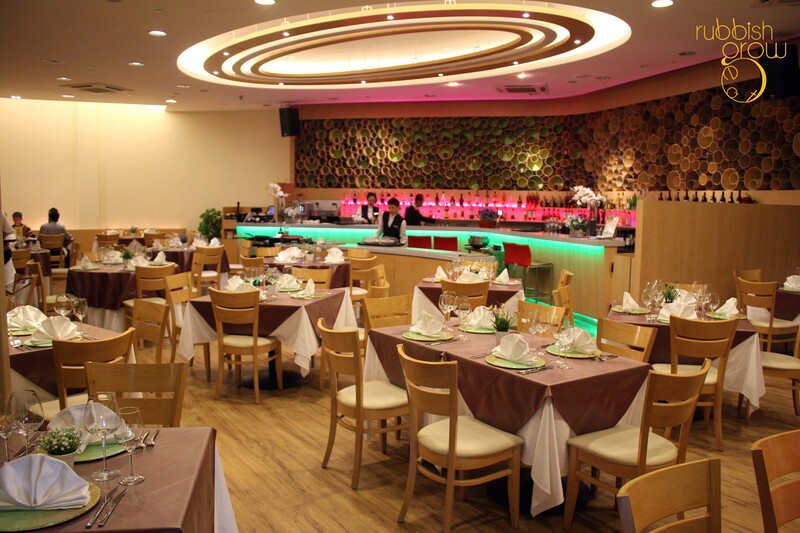 The decor is most light wood–chairs and floor–with a long bar counter of changing lights, exuding a casual, modern feel. 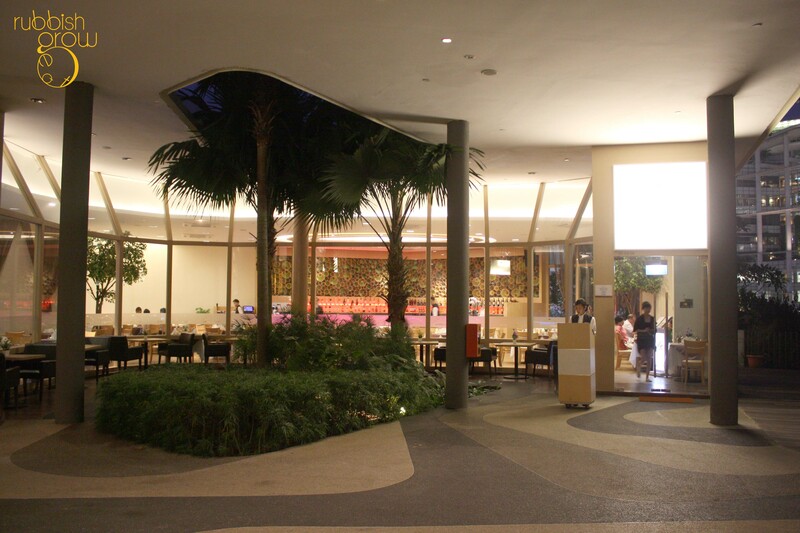 The outside rooftop environment and serenity of the restaurant make it a good romantic date place. There is also a private dining room, allowing 15 people with minimum spending of $1500. Who is Chef Daniel Koh? If you see his photo, you’ll know who he is. He is a celebrity chef who appears on TV often. He has 40 years of experience and has worked at Wolfgang Puck’s Chinoise in Melbourne, a fusion restaurant at a time when fusion food didn’t even have a name yet! 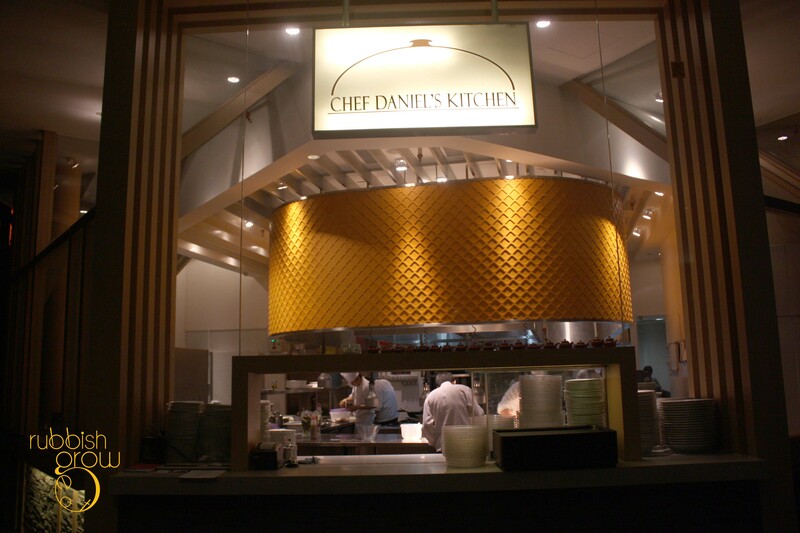 The food at Chef Daniel’s Kitchen is his modern take on Asian cuisine: western ingredients with eastern cooking methods. 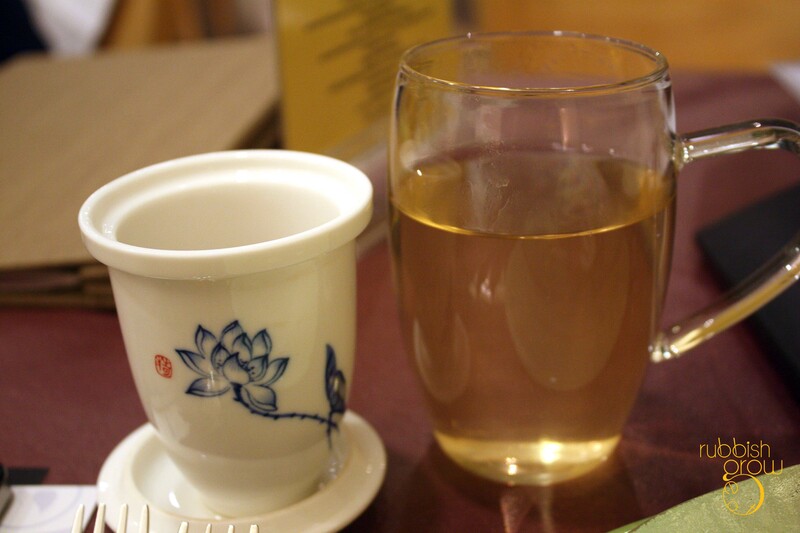 RERG loves Chinese tea so much we researched into Chinese Tea Pairing with food. But the teas at Chef Daniel’s Kitchen are very unique and cannot be found anywhere so the guide to tea pairing isn’t very useful in this case. Melicacy ordered Flower Fairy ($8), a combination of three teas, green tea, (purple) lily and osmanthus, which is painstakingly hand-sewn together in the shape of a bud. 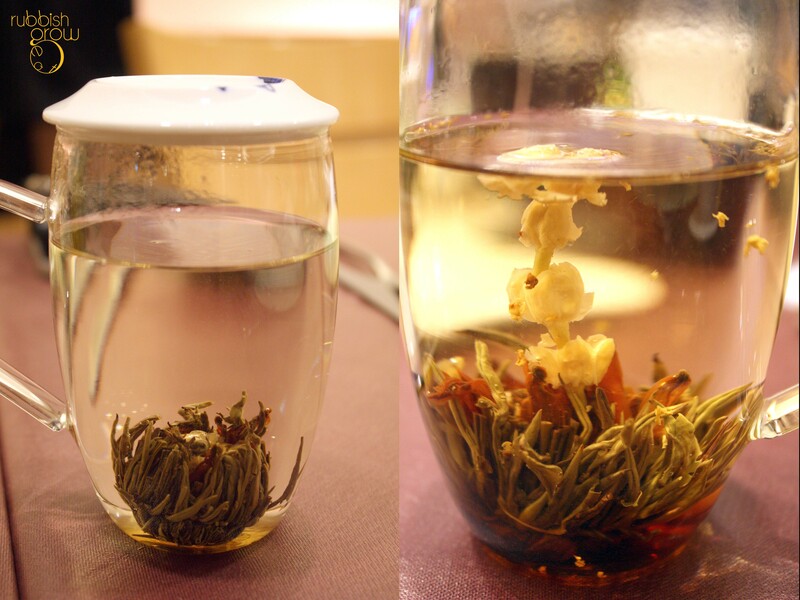 The “flower” blossoms in the hot water and you can see the three teas very clearly. Such a beauty! 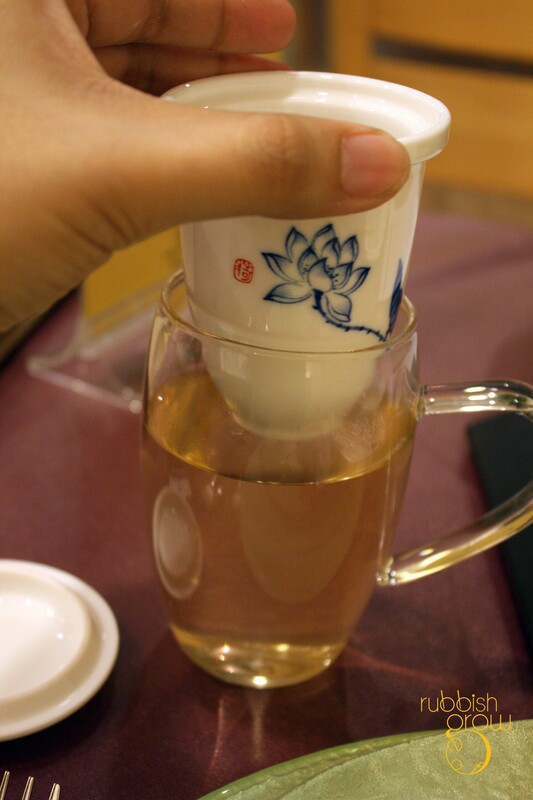 Before I talk about the best-seller snow white dragon pearl Tea ($8), look at the porcelain sieve. Isn’t the the most gorgeous tea sieve you’ve ever seen? The snow white dragon pearl tea is a white tea that is infused SEVEN times with jasmine and has FIVE times the antioxidants of normal white tea. God knows I need those antioxidants to stop my face from sagging. On the first brew, you shouldn’t let it soak too long. Take out the sieve when the buds are about to open. Subsequent brews can be longer. I really appreciate how careful the tea is selected and how it comes in individual tea sieves, instead of in a communal tea pot where the tea turns bitter from over-brewing. The tea here has no sugar added and has a natural sweetness and fragrance from the brewing of the tea itself. Not bitter at all and doesn’t have that tannin, dry tongue texture. Even on subsequent brews, the taste remains robust. This is some really good tea. $8 is quite value-for-money. Chef Daniel isn’t the first to have a rock & roll salad ($16) but it is always fun to have someone spinning the bowl in front of you. 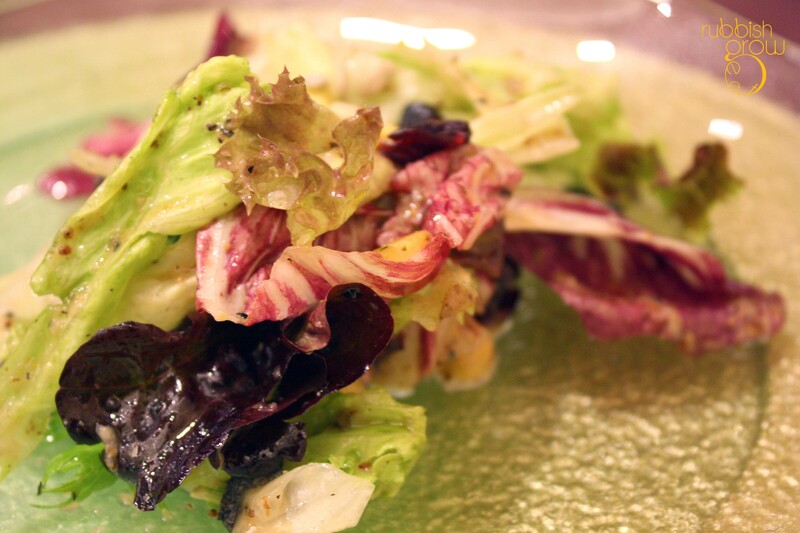 The salad is made from seasonal fresh green with chef signature dressing. In our case, there are fresh greens, raisins, cranberries, croutons, melon seeds, dried apricot, and sunflower seeds. The dressing consists of garlic, honey, mustard, egg yolk, olive oil, salt and pepper. Given that the dressing has honey, it is surprisingly tart and appetizing. However, to me, a carnivore, I could give this a miss. 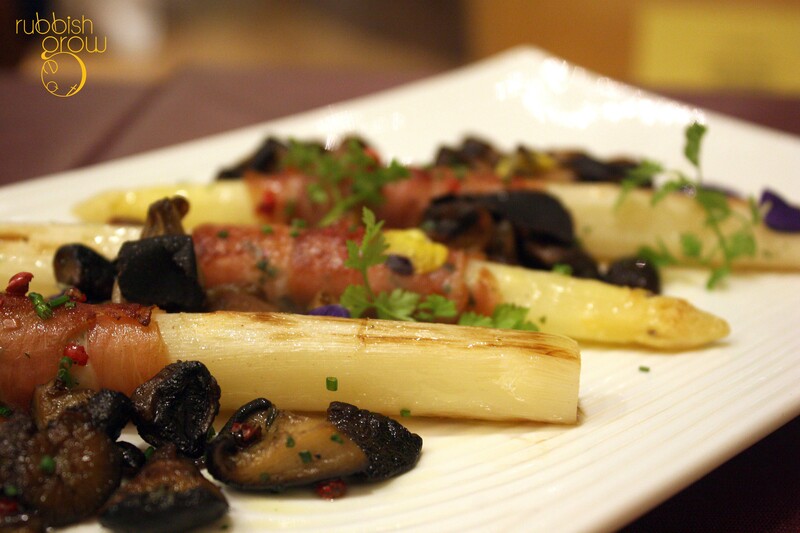 White asparagus ($24) poached in white wine & wrapped with parma ham, served with fried button mushrooms and truffle, drizzled with hazelnut oil, with pink peppercorn. The hazelnut oil isn’t doing much for me and makes the dish oily but as a counterbalance, when you bite into asparagus, the burst of fresh juice cleanses the palate. The parma ham provides salt to a otherwise mild asparagus. If typical, this is a pleasing dish. Pan seared tuna steak ($28) seasoned with cracked pepper and cumin, served with green asparagus and white wine butter sauce. The tuna is so fresh that it has no fishy taste but to ensure that the fishiness is completely eradicated, there is a curry-like sauce, giving this Western dish an Asian fusion. Not an unusual dish at any count, but it is well executed. 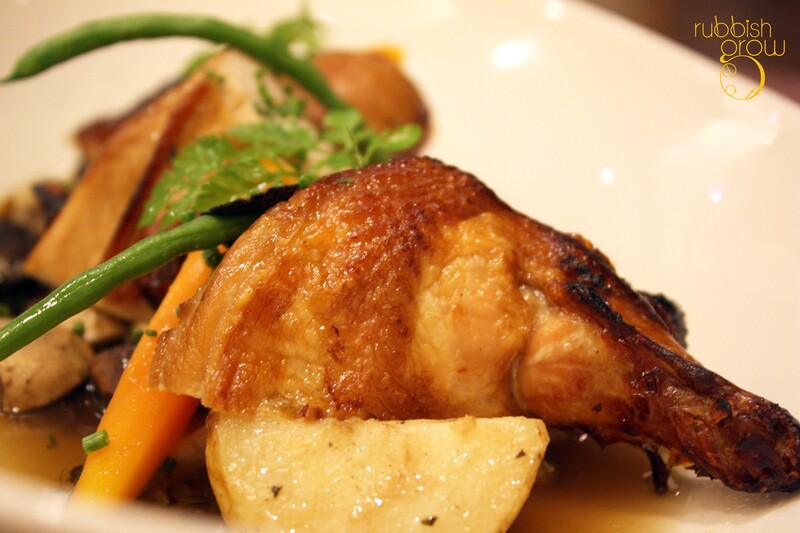 Oven baked spring chicken ($28) with seasonal vegetables, air-flown mushrooms, potatoes, truffles and white wine. If you have tasted chicken in a Western style before, you know that it can be rather bland. But this is where Chef Daniel’s chicken differs. 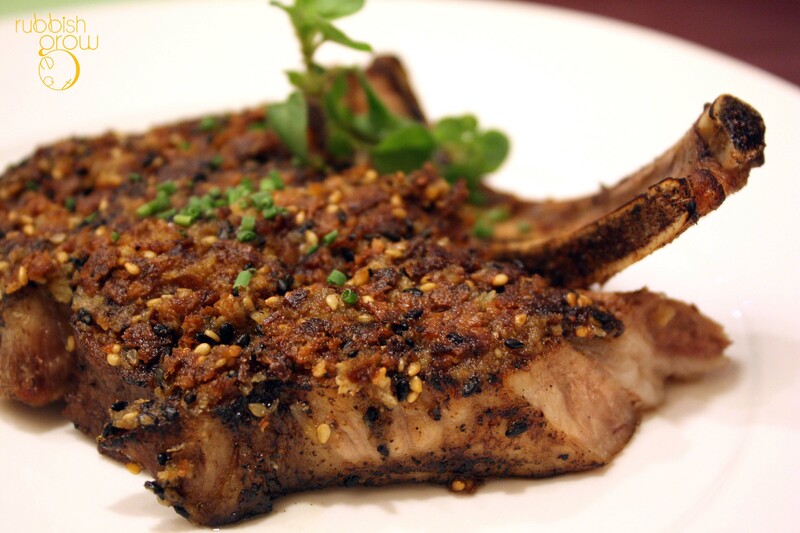 It is very, very flavorful with the marinate completely absorbed into the meat, giving it a very savory saltiness. The “sauce” on the plate is also very good, more like a light mushroom chicken consomme/broth. This is truly a East-meets-west dish. For the first time in our food tastings, we all agreed on the best dish: stewed lamb shank ($30) in chinese rose wine and red rice, served with pearl onions in lamb jus and herb-crusted potatoes. 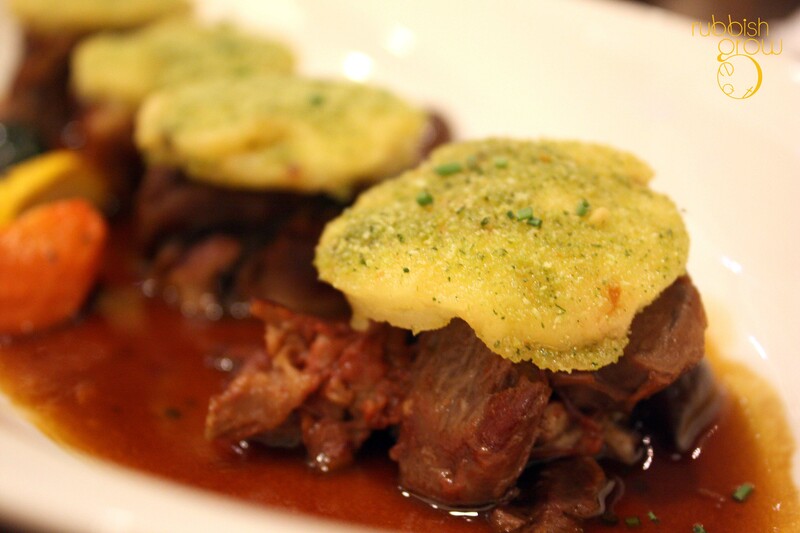 The rose wine sauce has thoroughly permeated into the tender lamb shank, giving it a wonderful sweetness. The herb on gratin-potato adds a great gritty texture. Like the previous dish of spring chicken, the stewed lamb encompasses the philosophy of Chef Daniel’s east-west cooking. An excellent and well-rounded dish. I am also exceedingly fond of U.S. Kurobuta pork cutlet ($58) with white pepper and honey pineapple sauce, and side dishes of mashed potato and vegetables. When it first arrived, I thought it looked desiccated but when you bite into it, there is a pleasant bite. It isn’t very moist but it definitely isn’t dry too. The crust of the cutlet is wickedly delightful, leaving you to guess the spices on top (sesame seed, bonita flakes, five-spice maybe?). You can add either the white pepper or honey pineapple sauce but to me, I prefer the sweet pineapple sauce because, tinged with cinnamon, the sauce enhances and brings out the tastes of spices and pork perfectly. A consideration, however, is that the pork is rather pricy. 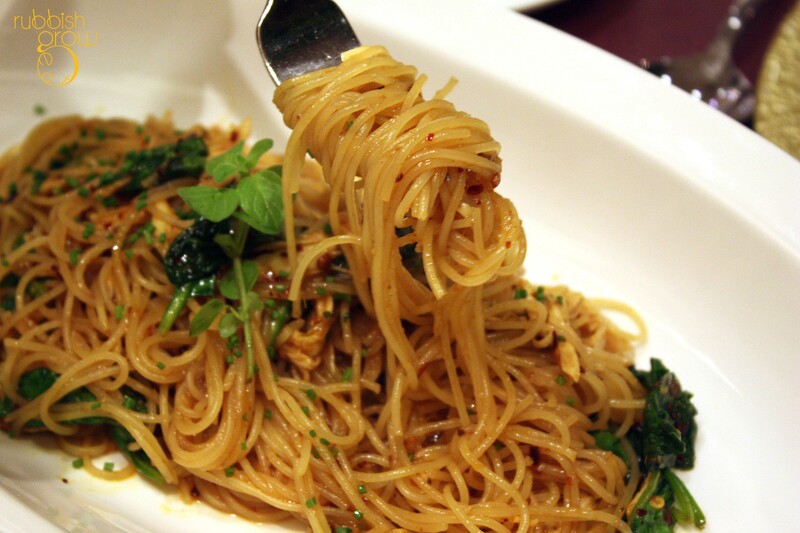 After eating a few courses, you’d expect us to be full but when the angel hair pasta ($18) with shredded chicken, spinach and tamarind reduction was served, the aroma was sourishly assam, so enticing, so mouthwatering! Done al dente, the pasta does taste like assam. While I wish there is more meat in the dish, the taste is undeniably tops: it has everything in it, sourish, sweetness, a bit of bitterness from spinach, and saltiness, making this a very layered, exciting and complicated dish despite its seemingly simple appearance. 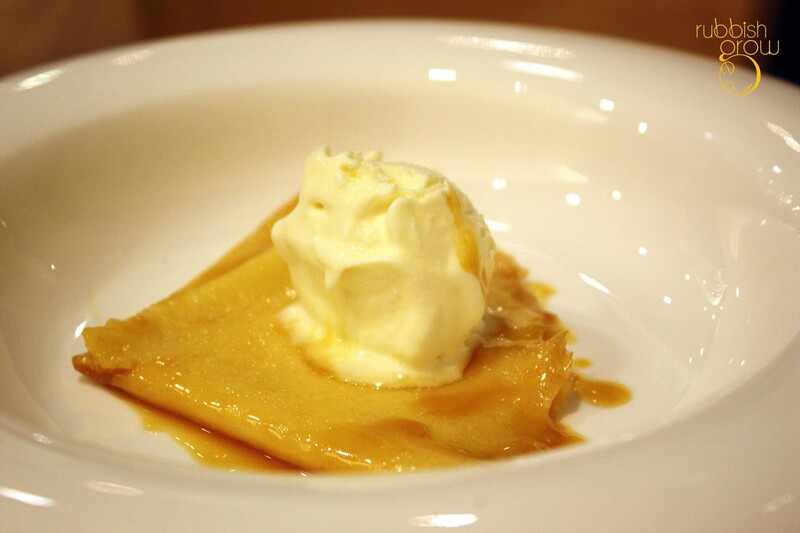 As many Asian religions believe that karma come in a full circle, we had a tableside service for the dessert too: a crepe suzette with vanilla ice cream ($12). The server first caramelizes white sugar. 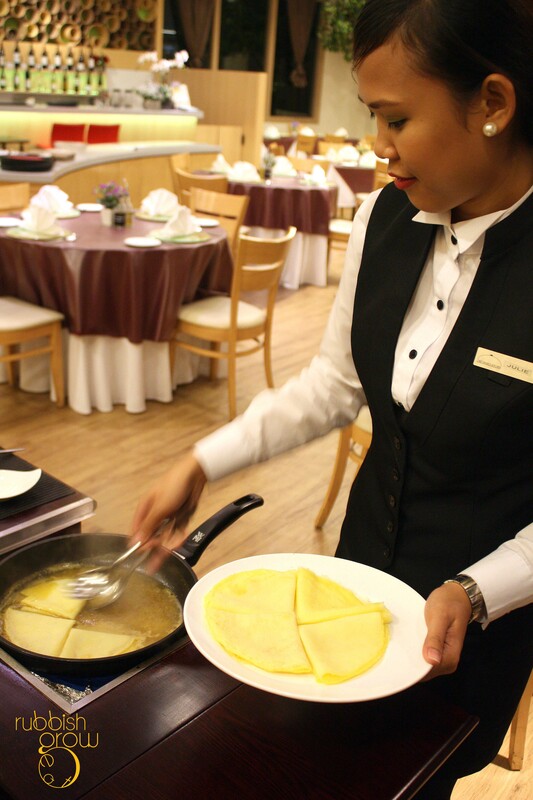 Instead of adding orange zest, which would destroy the smooth texture of Chef Daniel’s secret-reciped super smooth crepe, brown sugar is rubbed on an orange so that the sugar carries the citrus scent. Add orange juice. Add crepe. Add grand marnier (bitter orange liquor) so that there are flames, and let the crepe slowly absorb all those citrusy flavors. The ice cream melted so quickly on the hot crepe that I couldn’t take a proper photo! In 5 seconds, the ice cream completely melted. And the server was right: the crepe is delightfully smooth and slides down the throat. No complaints here, a wonderful dessert that is fun to watch. 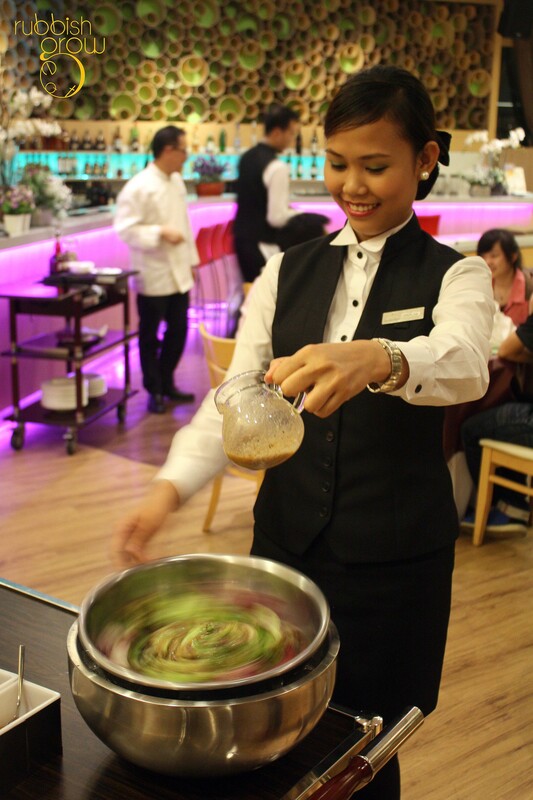 Service: The service is outstanding, so good that we didn’t notice when they topped up our tea for us, and when they brewed and lifted our tea sieves for us. That being said, there are some very goodlooking waiters and waitresses here! Conclusion: After hearing so many positive reviews of the restaurant, and having high expectations, the first three dishes don’t impress me; they are well prepared but ordinary. However, from the chicken onwards, everything is fabulous. The textures and flavors are well balanced. 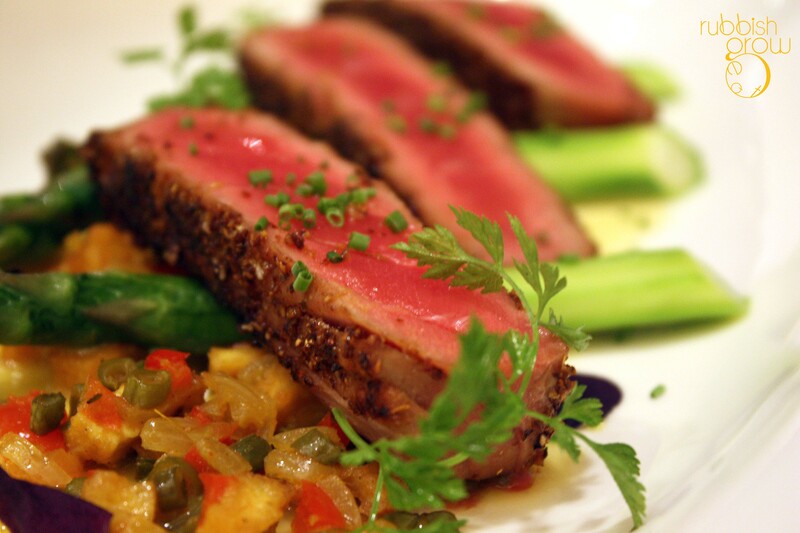 Chef Daniel’s 40 years of experience show most brilliantly in his more daring fusion dishes. But I think it’s wrong to even call the dishes “fusion.” Chef Daniel seems to create a completely different cuisine of his own, so unique it cannot be called fusion. He must think of a new name for his special brand of cuisine. PS: We thank Jenny, Daryl, Roy, Chef Daniel for the invited tasting and for hosting us till 10.45pm! (yikes, sorry for your OT.) Also like to thank six-and-seven for arranging this tasting. Thanks!